What Do Fish Tell Us? Similar to the study of macroinvertebrate populations, fish in Arlington’s streams tell a story about their health. Published by the Environmental Protection Agency (EPA), “An Introduction to Freshwater Fishes as Biological Indicators” is a guide for using fish as biological indicators. Can I Eat the Fish? The EPA makes recommendations for how much and which types of fish are safe to eat. Depending on where you are on the Potomac River, you could be fishing in waters that are under the jurisdiction of Maryland, Virginia or the District of Columbia. Women in their childbearing years and young children need to exercise the most caution when choosing which fish to eat. 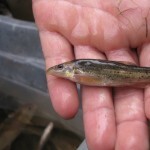 View Arlington fish sample data from fall 2011. 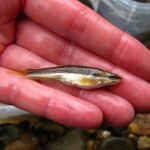 Longnose Dace: Intermediately to moderately intolerant. 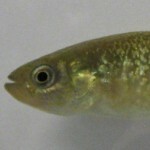 White Sucker: Tolerant – Can handle low oxygen levels, siltation, and organic and inorganic pollutants. Photo courtesy of Fairfax County. 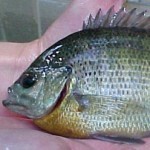 Bluegill: Tolerant – Can handle low levels of dissolved oxygen and habitat disturbance. Photo courtesy of Fairfax County. American Eel: Tolerant – Native and hardy, it can travel short distances on moist ground and is tolerant of pollution. Mummichog: Tolerant. Photo courtesy of Fairfax County. 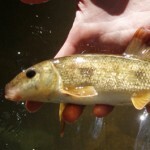 Want to Learn More About Virginia Fish?